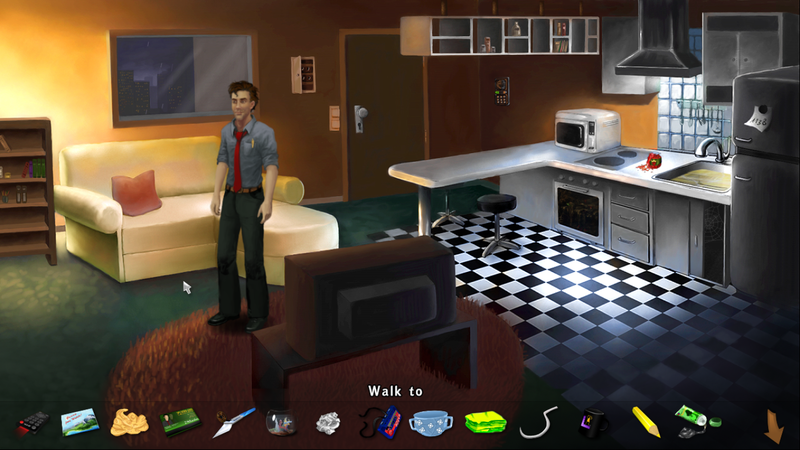 Zak McKracken: Between Time and Space, the far famed unofficial sequel to the original 1988 adventure game directed by David Fox, has been finally fully translated to English, voice acting included. After 7 years from its original German release, Artificial Hair Bros. have brought us for free this huge token of love and admiration for Zak McKracken and The Alien Mindbenders. The amount of work they did is amazing. Up to now, this was the toughest game for me to “deconstruct”, mainly because it’s the first time I try to include puzzle types as described brilliantly in this post by Scarpia, dated 2003 and still very valuable. I’ll quote their definitions from that post as I go on with my analysis. Also, I’ve placed some letters between brackets, to mark the kind of “reward” that the players get when solving a specific puzzle ([C] = Cutscene; [A] = Animation; [P] = Plot progression; [S] = BackstoryStory element). Of course I may have missed plenty. Apologies in advance! Behold the HUGE Puzzle Dependency Chart (actually this is just a thumbnail – Right click here to save the full version because it may not display in your browser)! I know: the design of this chart doesn’t look so great. This game was far longer than the average game (especially considering that it’s free) and has tons of puzzles. In this sense the game feels pretty old school in its design, and I mean it in a good way. EDIT: I forgot to mention that this is an analysis of the hard mode playthrough. Yes, the game features an easy mode as well! Still, it was getting frustrating to link all the elements in an eye-pleasant layout, so this time I let yEd (the free piece of software I use to do these charts) sort out the layout after I linked everything. I hope that it’s still understandable. Now, the first thing I noticed in this game are the Escape puzzles and Dialog puzzles it has. The game begins with an Escape puzzle. Zak is stuck in the cargo of an airplane and has to sort out a way to pry open a hatch and jump off. Those of you who played the original Zak McKracken, here will probably experience a small deja vu. This felt as a pretty cool way to start. An escape puzzle means that everything I need is right there, therefore I could get a sort of almost-instant gratification out of solving the very first puzzle. We encounter the second one when Zak takes his first flight in the game. Here the feeling of deja vu is much bigger. Here Zak has to do plenty of stuff in order to get a cup of coffee. Stuff that includes a repeated action puzzle that will lead you to smear feces all over the bathroom and serving peanuts to an old lady, after you grabbed them out of a clogged toilet and rinsed them with water. This initially felt out of place, for me. Funny, of course, but a little out of place. 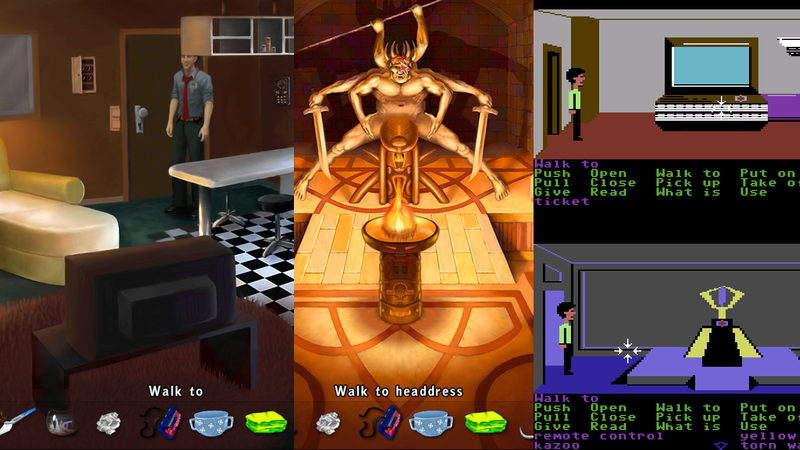 The thing is: I’ve always treated Zak McKracken as a more “serious” game, especially compared to Maniac Mansion and The Secret of Monkey Island (to name just some). Of course it had lots of funny scenes and situations, but, I don’t know, they felt mixed better with the overall mood of the game. Also, in the original game there was a similar section where you had to mess with the flight attendant in order to get items that were crucial later on. Here the only thing you need later on is a chamber pot that it’s actually given to you almost right away. The third one is pretty short and straightforward and follows a cutscene. It pushes you to interact more with the environment, which is always a nice thing to do when designed in an interesting way. This is triggered sometime after you’re able to go to Paris, apparently. But it is mandatory to face if you have already been in Scotland. This represents both an escape puzzle and a clever repeating puzzle. It’s actually the same as the very first one that’s in the game, with a single addition. I think it’s clever because it represents a point in the plot where things are finally coming back together so provides some rest to your brains and sort of an adrenaline boost! A thing I found interesting was that you had the chance to open the box and get the vaseline again, if you forgot to take it back after incinerating Jacques. It felt like a clever way to cope with what could have been a really bad dead end. This game features three dialog puzzles, one of them is pretty huge and the last one is, actually, more of an encore which I believe was introduced in the Director’s Cut version, at the end of the game. As Scarpia states, dialog puzzles can be interesting, but the risk of them ending up being boring is always high. I’ll quote another excerpt: “If the puzzle is too complex, or the dialogue isn’t humorous, the player will soon stop reading the dialogue and just click frantically through different choices until he’s explored all the possible combinations of the dialogue tree.”. Which is amazing, because that’s exactly what I ended up doing for the biggest of these puzzles, the one where you have to convince the Caponian that you are The King. Both this and the first one (that you have to face in order to get the order for an Elvis’ wig) are somehow helped by at least one item or hotspot in the game. You can find a hint to get the wig on the leaflet that is attached to the Artificial Hair Bros’ shop window (later on in the game). 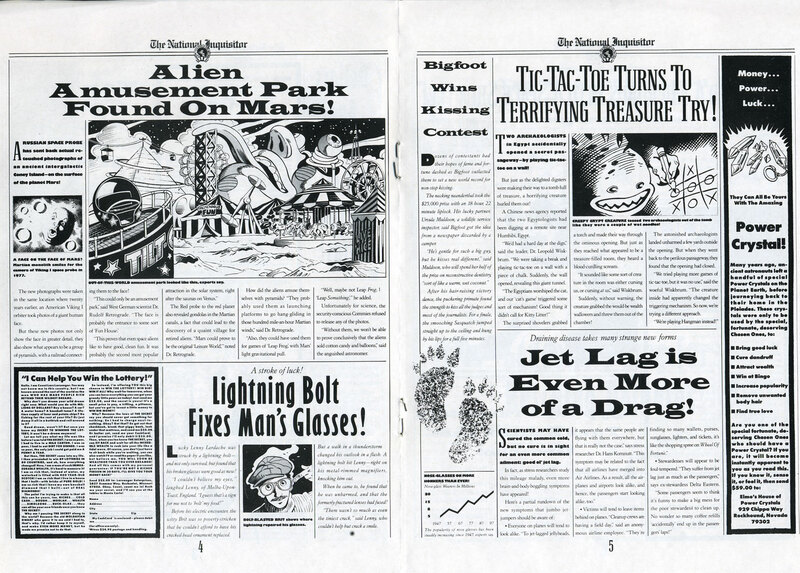 For this huge one, instead, the hint lies in what appears to be just some strange news on the newspaper pieces you have collected. The original Zak McKracken featured a wonderful physical “copy” of the National Inquisitor in the game box which also featured lots of hints. I admit I binge-played this game. I’m guilty of trying to finish a really long game quickly and the outcome was that puzzles like this one just “got in my way”, therefore I didn’t appreciate them as they probably deserved. In my first playthrough I couldn’t figure out what I had to do in order to take out the maitre in the fish restaurant in Paris. Banging my head for a while (playing the game again and saving in multiple slots) I eventually found out that there’s at least one dead end in the game and you will most likely miss it if you don’t pay close attention (just like me). When you are going to replace Jacques’ suntan oil with the vaseline, be sure to have first asked Annie about the book she’s reading, then give her your newspaper in exchange for that. If you incinerate Jacques before getting the book you can’t get it afterwards (at least, that’s what I figured out), therefore you can’t use it to talk with the customer that ordered soup in the fish restaurant. EDIT: Thomas Dibke, main programmer of the game made me realize that actually there is no dead end! If you incinerate Jacques before getting the book you will find the book under the seat at the airport. I think those damned Caponians made me stupid enough not to pay attention! Thanks a lot for the heads up, Thomas! One simple example: feeding bones to the dog outside the scouts’ camp, doesn’t help you as you may have thought! Read the newspaper for the hint you need! In Zak McKracken: Between Time and Space there are a some puzzles that gave me a really bad time. These are marked with three exclamation marks (!!!) in my Puzzle Dependency Chart. The first one: when in Mexico, among other stuff, you have to find out about what happened to the disappeared archaeologists. Other than an abandoned excavation site, you have no other clue. Also, the scouts’ camp, once you finally manage to get past their gate, is filled with people that has no information whatsoever about them. So, how did I manage to find out that what I had to do was to throw a stone that I found earlier on laying around into a pit? Merely trial and error, unfortunately. Thinking more about it, later on, I found out that probably the only hint for this puzzle is written into a single line of one of the articles in the newspaper that brought you there in the first place. Still, I think of it as a pretty vague one, since mentions the archaeologists to be disappeared “as if they have been swallowed up by the earth” and that’s it. 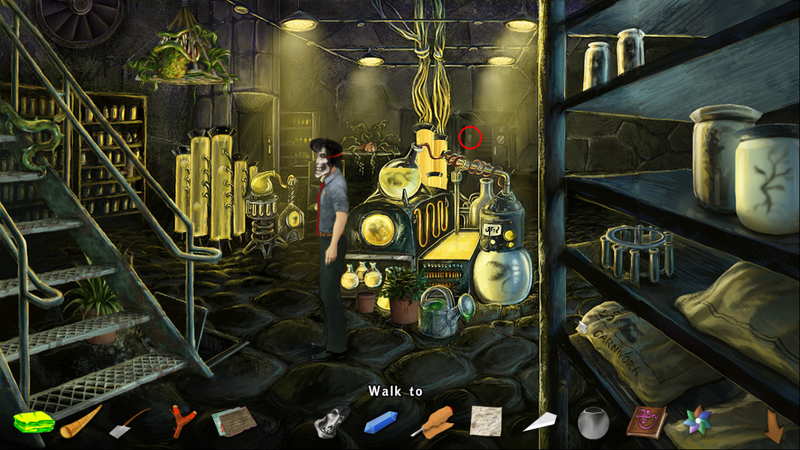 Other tricky puzzles are related to blowing up the Caponian lab. First, to do that you have to find a detonator, a cable and the actual bomb. The most difficult piece to find was the cable, because it hangs behind the door of the lab, which is left open once you enter. To take it you have to close the door first. The cable is actually a really tiny spot a room full of props. The graphic design of the room really didn’t help me! Now, while the game – developed with Visionaire Studio – gives you the chance to see all the hotspots in the room you’re in (which helps what could have been some pretty heavy “pixelhunting” here and there), of course doesn’t show you the stuff that is meant to be hidden to you. The only possible (yet extremely vague) hint to solve this, I think is that every time you enter the room you actually have to wait for Zak to come in for a couple of seconds. I recall a similar puzzle in Day of The Tentacle, where you had to take the keys hanging from the door of one of the clients of the Edisons’ hotel. 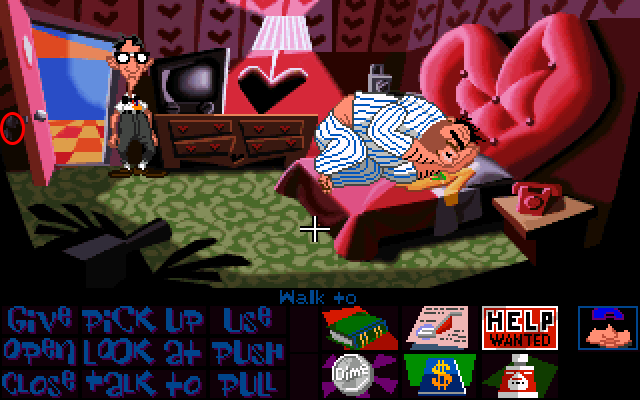 But there are at least two differences in the DOTT one: the level was far smaller, with many less items and you could more or less see (yet barely) the keys hanging from the door when it was open. Oh and also, right click to close the door and the keys are gloriously there for you to take! Second, the very last action you have to do in the game is to use the bomb to blow up the Caponian lab. Literally. I mean you have to use the bomb while it’s in your inventory: Zak will go to the perfect spot and finish the job on his own. This felt “odd”. When I assembled the bomb I would have never thought I could use it basically anywhere. I thought I should have placed it somewhere. Unfortunately there’s no other solution for this puzzle: if you use the bomb on the very same spot where Zak puts it on his own, the puzzle is not solved. For a long time I just thought I couldn’t find the right place, while I had it literally in my pockets! Off the top of my head, in this game, I recall that the room screens don’t ever scroll vertically. Yet, there is the puzzle that involves controlling the bird to get the berries needed to brew the poison that requires you to move over the top of the screen. I don’t mean that this is a nonsense puzzle. Berries grow on trees after all (even if you find these one in the bird’s nest). But I can’t recall anything that may even remotely suggest that the room extends vertically. Once you gain control of the bird using the blue crystal on it, the only thing I thought I could do was to just fly into the house to grab the key. If I had more occasions to see that the levels could extend vertically, probably I would have solved the puzzle more easily. Even if, as I said, I binge-played this game, I still enjoyed it. I’m a big Zak McKracken fan and I was looking forward to the English release of this fanmade sequel since the German version was released. The game is fulfilled with love for the original game, which translates in having multiple similar puzzles (using Sushi’s bowl for other purposes, newspaper hints, using the remote control to get the crystal*, using the crayon on markings, etc.) and recurring funny situations and quotes. There are even cameos of David Fox and Matthew Alan Kane! Leslie Edwards voices more than one character! Artificial Hair Bros. put a great effort in making this game (and in translating it) completely for free and I’m really happy that their new adventure game The Mistery of Oak Island was successfully backed on Kickstarter! That said, there were puzzles that, in my opinion, made the experience tougher to appreciate, mostly because I couldn’t make head nor tail out of them. The overall plot took a while to get to me, I found myself more feeling like I was going through a series of puzzles rather than advancing in a story, but, again, the game is pretty big in its design and the developers made a great job nonetheless. A great help in my playthrough was given to me by my usual check-and-grab-everything-you-see-if-you-can-do-it™ approach, which applies to any kind of game I play. This saved me from going back and forth the various locations of the game in more than one occasion. 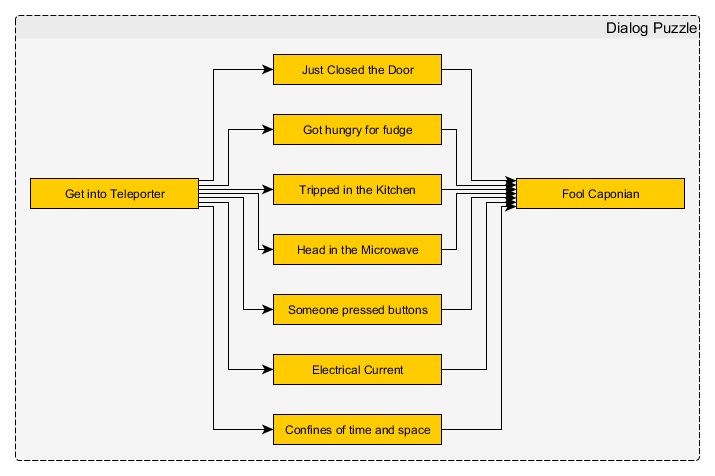 I’m getting lots of wonderful feedback for these Puzzle Dependency Charts. I’d mainly like to thank the Irish Game Developers’ scene and the Adventure Game Studio community for all their tips and suggestions. If these charts are getting better is mostly because of them!